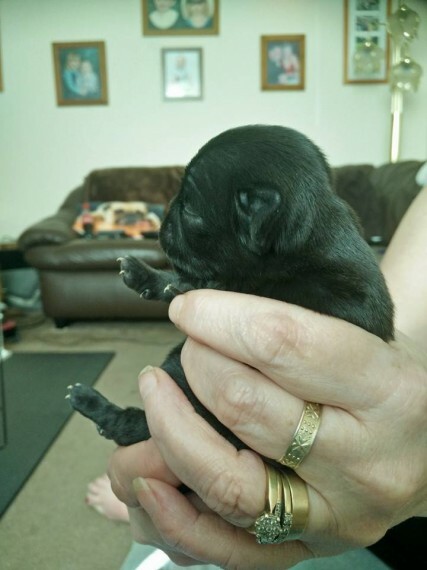 I would like to introduce my stunning litter of 5 pug puppies These pups will be ready to view from the 25/2/18 but will not leave for their new homes until the 25/3/18.So this will give you time to save for the pup of your dreams. these babies are self whelped and true to form. Mum is our apricot purebred pug (no papers) dad is a full KC reg chinchilla, who is PDE and PK clear, both are our family pets and can be viewed. They will leave with their first injection,micro-chipped,flea treated, wormed up to date, 4 weeks free insurance, and a letter of my vet confirming great health of pups. They will also leave with a puppy pack this contains Blanket (with mum's scent), toys, food, and a personalised puppy document pack. These babies are being brought up in our home and are being handled everyday, and are getting used to all household noises. Deposits of 150 (non-refundable) will secure the pup of your choice. Photos of pups do not do them justice but will update on a weekly basis. Please do not hesitate to message me for more information. 2 Black girls 750 each ( sold ) 2 Silver platinum girls 850 each 1 black boy 700 if interested can you text or phone me as i dont think my email is working properly. Thank you.